For my latest photoshoot with Karolina Ryvolova I've decided to make an evil queen crown to add some epicness to the pictures. 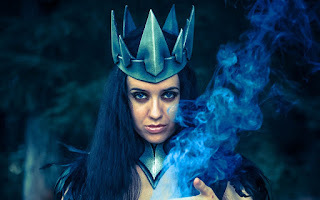 I kinda like the crown of Ravenna from Snowwhite and the huntsman movie, so I've searched for some reference pictures and found a tutorial by esellecrafts (link and video below). I really like what she did, but I decided to take it to another level and remade the pattern of hers a little bit. You can download the pattern below, print it out and make it out of hard paper or foam. I did my crown from 0,5 thick EVA foam. First I measured my head for the right fitting of the base piece (please, keep that in mind when using my pattern - it fits on my head, but you have to adjust it a little to fit on your head). 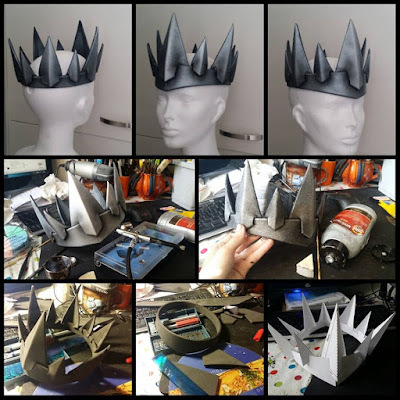 Then I transfered all the patterns I made from paper (and tried to assemble a crown from them before - because measuring 3 times makes the 4th time perfect) on the foam. I cut the shapes out of the foam (scissors or exacto blades). If you use scissors, the borders would be uneven and you have to send it a little with dremmel tool, Also sand the borders down even when you want to have the crown smooth and pretty. Then I've used exacto blades to make two small cuts next to each other on the markings of each pointy part (you have to transfer the markings from the pattern onto the foam) and ripped of the inner foam between the two small cuts - I made the space for the base of the crown. Then there is a line in the middle of each pointy part. You have to take the exacto blade and from the backside of each pointy part make two cuts in 45 degree angle against each other and so make a small V cut in the middle. Then put a contact glue/barge/chemopren glue inside the V cut, wait for the glue to be dry and connect the cut together. This will make you achieve the two-sided look of each pointy part. Then assemble the pieces as written on each pattern. Begin with the point 1 in the front, put point 6 in the back, the put points 5 and 2 from each side of 6 and 1 and continue like that. When you're satisfied with the look, make markings on the foam where the point will be and glue them onto place. Then use black acrylic color as base color. Put a silver color on a sponge and tap it all around your crown for the base silver color. Then mix the silver color with white and tap on the points and higher places for highlights. Then take black color and make the corners and dents darker and blend the color as best as you can. for a painting tutorial, check out my videos HERE. And the pattern for DOWNLOAD IS HERE. I hope this pattern will be useful for someone and if yes, you can follow my work on cosplay (and other stuff) on my FACEBOOK PAGE. and if you like this stuff I do, you can support my work by donating on my TWITCH CHANNEL.